DID any birds kick the bucket in your house lately? 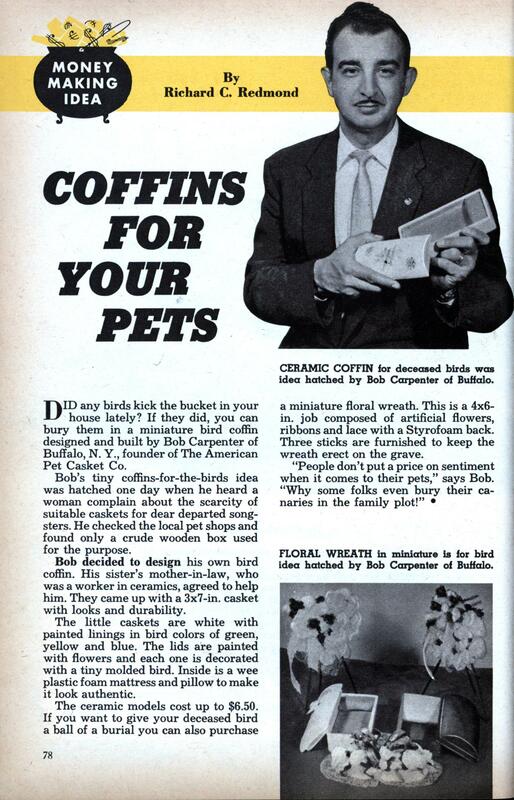 If they did, you can bury them in a miniature bird coffin designed and built by Bob Carpenter of Buffalo, N. Y., founder of The American Pet Casket Co.
Bob’s tiny coffins-for-the-birds idea was hatched one day when he heard a woman complain about the scarcity of suitable caskets for dear departed songsters. He checked the local pet shops and found only a crude wooden box used for the purpose. Bob decided to design his own bird coffin. His sister’s mother-in-law, who was a worker in ceramics, agreed to help him. They came up with a 3×7-in. casket with looks and durability. The little caskets are white with painted linings in bird colors of green, yellow and blue. The lids are painted with flowers and each one is decorated with a tiny molded bird. Inside is a wee plastic foam mattress and pillow to make it look authentic. The ceramic models cost up to $6.50. If you want to give your deceased bird a ball of a burial you can also purchase a miniature floral wreath. This is a 4×6-in. job composed of artificial flowers, ribbons and lace with a Styrofoam back. Three sticks are furnished to keep the wreath erect on the grave. 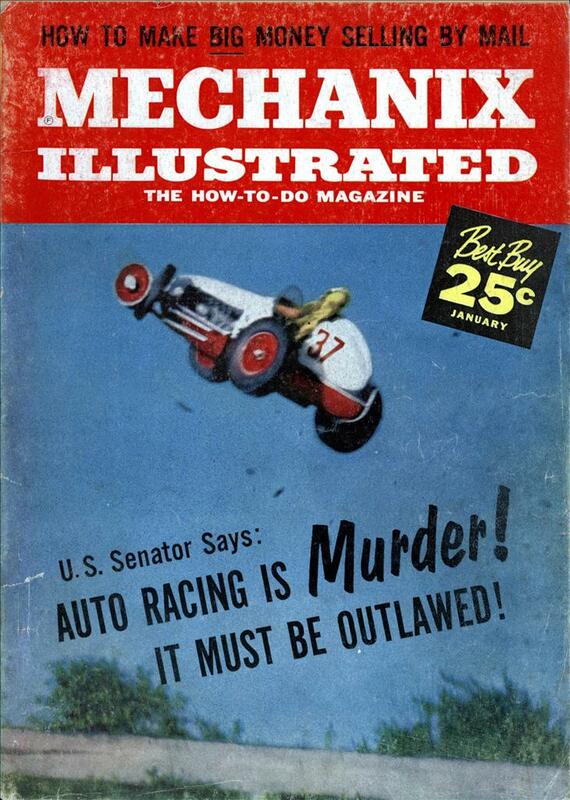 Didn’t they have cigar boxes and shoe boxes in 1959? Nah, feed the birds to the cat. Heck, even in ’69, many cigar boxes were too nice to use for that purpose. Then again, my current vet returns animal ‘cremains’ in very nice containers not unlike those described here. You can even tell by the look on Bob Carpenter’s face that he’s conning you. Is that a little pillow I see at one end of the “coffin”?